Because our first walk when I returned was a nightmare! We’ve all been there. Well, most of us. A crisp early-spring morning, I was feeling relaxed after a week of pizza and Prosecco, happy to be back out with Fifi and Lao. Meandering along the river, not a soul in sight. Then out of nowhere: two dogs! Bounding up the riverbank at breakneck speed! (I won’t name the breed as it’s not important to this story… but they were small and determined!) I daresay this scenario would have been intimidating even for ‘sociable’ dogs – especially given the element of surprise – but for Lao it was catastrophic and he went into full panic mode; lunging, barking, snapping. The other dogs’ hackles went up and their bodies stiffened. In dog language this is bad. Their human was nowhere to be seen. Feeding any dog without asking first is something I would never normally do. They may be on a diet, they may have allergies. Better that than a bloodbath. So I threw a handful of treats into the path of the two dogs. It was an instant decision and hallelujah it worked. Noses down, sniffing out the treats, giving us that much-needed break to get out of there. I looked over my shoulder and a man sauntered up the riverbank, fishing rod in hand. He seemed confused about what his dogs were eating. The games we play with our dogs at home can turn out to be lifesaving. But only if we put in the prep first. When I first start working with new dogs on Enrichment Breaks they sometimes don’t know how to search. As it’s such an essential skill, let’s look at how to do it. The simplest game in this blog series! 1. With your dog in front of you take a handful of their daily food allowance and scatter it on the ground. 2. Dog eats food! Finito! Begin in a quiet, non-distracting area of your home or garden. 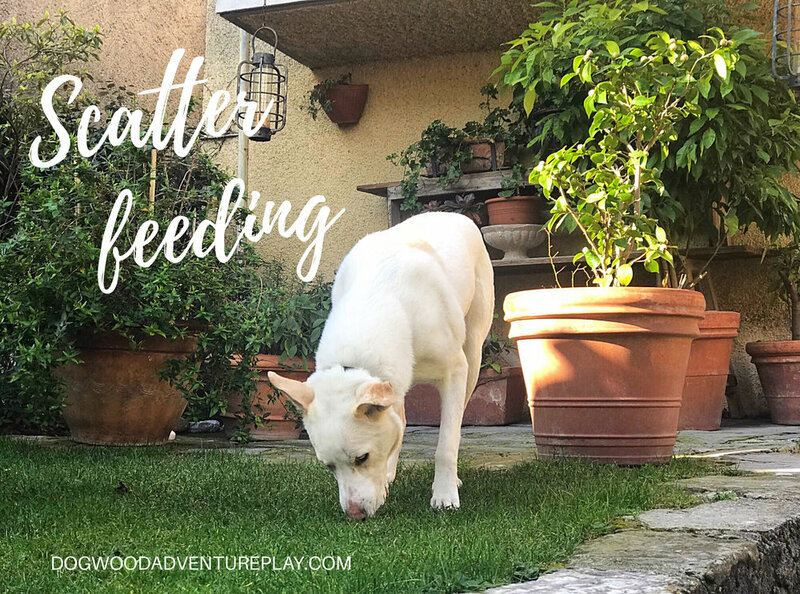 At first scatter the food in a small area and gradually make the area larger until you are literally throwing a handful of treats as far as you can across the garden. The further you spread the food the longer your dog takes to find it and the more contented and relaxed she’ll be afterwards. Take the game out on walks (quiet areas first) or to Dogwood. If scatter feeding while on a walk or at Dogwood ensure that it is a low-energy exercise session. Feeding dogs before, during or after strenuous exercise is dangerous. Clean up any uneaten food so that other dogs don’t find it (remember what I mentioned about diets and allergies). If you entered 2019 thinking it would be the year you changed something in you and your dog’s lives, it’s not too late. It’s now officially Spring and Spring is the time of the year when all things seem possible - so seize that feeling and run with it… or scatter it. We can’t recommend scentwork as a means of enrichment highly enough. To find out more about Enrichment Breaks, please get in touch. Older PostSetbacks & Struggles... or should I say pizza & Prosecco?